Affiliate Summit, the leading affiliate marketing industry conference and exhibition, will feature Evan Weber, CEO of Experience Advertising, Inc., as a solo presenter for their upcoming Affiliate Summit East (#ASE17) conference. Affiliate Summit, the leading affiliate marketing industry conference and exhibition, will feature Evan Weber, CEO of Experience Advertising, Inc., as a solo speaker for their upcoming Affiliate Summit East (#ASE17) conference. 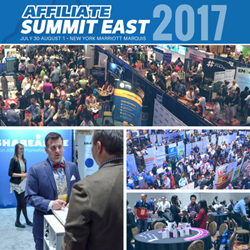 Affiliate Summit East 2017 is taking place July 30th-August 1st, 2017, at the New York Marriott Marquis in NYC, NY. Affiliate Summit was founded by Missy Ward and Shawn Collins in 2003 for the purpose of providing educational sessions on the latest affiliate marketing industry issues and fostering a productive networking environment for affiliate marketers, advertisers, ad networks, agencies, and other like minded performance marketing industry individuals. Affiliate Summit has cemented themselves as the must-attend affiliate marketing conference taking place twice a year, with several thousand attendees at each show. This three-day conference includes a large-scale exhibit hall with 100's of merchants, vendors, and ad networks exhibiting. There is a complete line up of the who's who in the affiliate marketing industry, giving lectures and sessions of educational material covering a wide variety of topics related to affiliate marketing and Internet marketing in general, as well as covering the latest trends and information from affiliate marketing experts. Weber stated, "I am thrilled to be a featured speaker at Affiliate Summit West 2017. It's a true honor to be selected. I look forward to delivering a dynamic, knowledge-packed lecture with practical strategies and plenty of examples from my direct experiences with cloud-based tools. I'm especially excited to meet the conference attendees afterwards and answer their questions. Another very exciting aspect of this particular event is that I will be trying to win the overall most attended session for the 3rd time, so I hope to see a big crowd there." Evan Weber’s Digital Marketing Philosophy: Weber states that he believes in implementing a comprehensive digital marketing strategy for his agency's clients. He also provides various types of consulting for companies of all sizes, working with their in-house staff to implement better strategies, improving processes, and refining campaign management techniques. Weber stated, "I really enjoy working with companies to help improve how they handle digital marketing in-house, as well as bringing them new tools and widgets to add functionality and boost conversions. When I can come in and make a significant impact in a short period of time, it's a fulfilling experience for me, so I enjoy doing that." Affiliate Program Management Agency OPM: Experience Advertising is recognized as a leading "OPM" agency (outsourced affiliate program management). They manage affiliate programs for companies in a wide variety of industries on the major affiliate networks and in-house programs as well. Mr. Weber stated, "I started this agency to focus on managing affiliate programs because I saw a lacking of really good affiliate management in the industry, since companies generally don't have the ability to manage their affiliate program well in-house. I knew this to be the case, coming from the merchant side of the industry. I knew that if I brought my proactive brand of affiliate management to the industry it could have a profound effect and I could reach large groups of affiliates with my content and support, which is personally very fulfilling. So I've really enjoyed running the affiliate side of my agency over the last 10+ years because I've been able to directly impact 10's of thousands of affiliate marketers directly."